BERKELEY, California. Dilbert is a comic strip that can not be taken for granted. Each day the reader will be hit with an unexpected zinger that can provoke a sudden guffaw. A careful reader may detect a touch of philosophical methods in the strip. 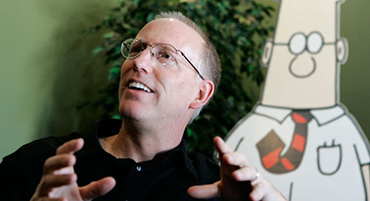 especially after Scott Adams, the creator of Dilbert, wrote a book titled, God's Debris, about a little boy questioning an old man who seems to have the answer to everything. The book is not only entertaining but with deep answers to those questions with wisdom. When asked if he had majored in Philosophy in college or university, Adams replied that he only studied the required philosophy class in college. An acquaintanceship with Adams had begun at a benefit performance in Northern California for an animal rescue organization. Adams was a featured guest and supporter. This writer was the master of ceremonies for the program. Some lunch dates followed along with some email exchanges that were lively. In one he mentioned something offbeat about U.C.Berkeley. In the reply he was reminded that the town of Berkeley that hosts the university was founded on April 1st – April Fools Day, making it all a (possible) colossal joke on the world. Your suggestion that Berkeley may not actually exist has had an enormous impact on my life! And I have thought of little else since receiving your communication. Berkeley was founded on APRIL FOOLS' DAY which means it all might indeed have been a sick joke on the world; that no such town was actually founded as has been represented. What makes it even more suspect (as you have opened revelation to me) is that they chose as the name-sake for the town and their university, Bishop George Berkeley, a Christian bishop and philosopher. How unlikely! Perhaps, as you suggested, Berkeley is only perceived by us to be there since the town and university claimed to have come into existence on, yes, April Fool's Day. And we fell for it. Bishop Berkeley (correctly pronounced BAR-CLAY- in England from whence he came), taught that what is perceived exists and what is not perceived does not exist. If for instance a wife perceives that her husband is unfaithful, even though he is totally innocent, she, by perceiving that he is, has brought it into a reality that causes her to suffer just as much as if he actually was unfaithful. So by that standard, perhaps we perceive falsely that the town Berkeley exists when it actually does not. We have all been duped! Then there is the question as to whether we ourselves actually exist. Descartes said that we should doubt everything. Even our own existence. For example, when I woke up this morning, after finally dropping off to sleep in mental exhaustion after examining the problem you posed, I suddenly doubted that I was actually awake. Was I really in a natural state, or, was last night, when I thought I was asleep, the natural state? According to Descartes, we must doubt all things, and that we can only arrive at sure knowledge by the systematic application of doubt to one's beliefs. So if I believe that I am awake, I can only be sure of that [if] I doubt that I am. The absence of doubt declares a flawed concept, when in reality I might not be anywhere, awake or asleep! Descartes doubts everything except the need to doubt everything. Indeed, according to his writings, there can be no truth without doubt. His one truth was found in the very idea of doubting. I sat outside with my lab, Rusty, in deep thought and concern about this (I was the one in deep thought, not Rusty). Suddenly I cried out, "Je pense domic je sis. cogito ergo sum!" (for I studied Latin in high school) meaning, "I think, therefore I am." My thinking self is a thinking thing (even though Kant and Locke would not consider the self as a "thing"). You might have read that a master-mind professor teaching a U.C. Berkeley art class, brought in a live chicken and brutally and cruelly slaughtered it as an art statement that we should not look at chickens as something good from Kentucky Fried Chicken but to realize the suffering the animal goes through to give us that chicken dinner. To protest the cruelty to animals this genius cruelly kills an animal in front of the class. This PROVES that the students and teachers of U.C. Berkeley do not think! And according to Descartes, only a thinking person can exist. EUREKA! You are right! Berkeley or anybody in it does not exist at all! We have all been had! What a relief to know that U.C. Berkeley and the town that supposedly houses it is not there. The world can breath a sigh of relief. I left the house rejoicing over this finding (thanks to your analytical mind) and took a walk through the Mall, when I suddenly was seized by a thought, which I in turn seized: and cried out: "I am aware of my existence, therefore I must be." Now do you see what you have done? You have totally affected my life!. Don't be mad at me. I only exist in your mind. Rev. Austin Miles earned his Bachelor of Arts Degree in Philosophy at Trinity Theological Seminary.